In this Phase III study, Pharm-Olam partnered with a progressive company to help find a better solution for those suffering with this deadly, rare disease. Allergic rhinitis affects between 10% and 25% of the worldwide population, and is observed most in ecologically unfavorable regions. See our study for more. Glioblastoma / Anaplastic Astrocytoma is a brain tumor with very few available therapies. 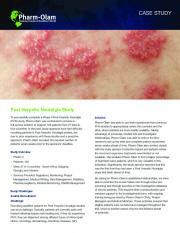 Learn more about our search for effective treatment options. SLE is a notoriously difficult-to-diagnose autoimmune disorder with no known cure. Our study aimed to find a treatment for severe cases of the disorder. Pharm-Olam was called on to rescue a Breast Cancer bioequivalence study. Learn how this transition process successfully supported the study sponsor. 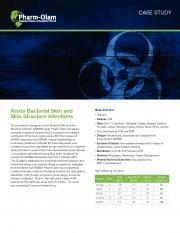 Pharm-Olam provided clinical research services on a pediatric Respiratory Distress Syndrome study. Discover the unique challenges and solutions involved. 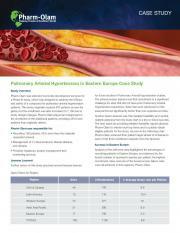 Pharm-Olam provided a complete enrollment solution for this ABSSSI study. Learn how Pharm-Olam’s efficiency allowed for a quick turnaround in this study. 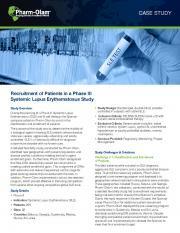 Learn how Pharm-Olam overcame difficult enrollment challenges in a massive Systemic Lupus Erythematosus trial and earned high praise from the sponsor. BA/BE studies require samples of the investigational product to be retained. 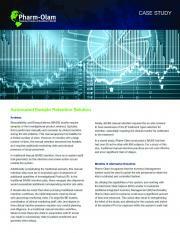 Learn about Pharm-Olam’s automated solution that saves time and resources. Pharm-Olam rescued a Rheumatoid Arthritis study suffering low enrollment. Learn how Pharm-Olam delivered 75% of the requirement not provided by the other CRO. Learn how Pharm-Olam handled challenges such as unpredictable seasons and high patient withdrawal rates in these Birch and Grass Pollen Allergy studies. Pharm-Olam rescued this Rhinitis study by recruiting 263 children across 10 centers in Poland in two seasons, gaining praise from the Study Sponsor Manager. Pharm-Olam rescued this study begun by another CRO struggling to meet recruitment deadlines. Learn how the successful rescue led to an NDA drug approval. Learn how Pharm-Olam provided monitoring for all 456 patients in this Glaucoma and Ocular Hypertension study, along with other crucial study support. Learn how Pharm-Olam assisted with strategy and implementation in this prostate cancer study and how it led to more research opportunities with the sponsor. 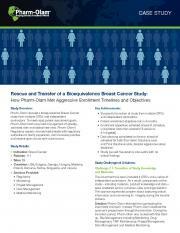 Pharm-Olam aided in the recruitment of 723 patients for this breast cancer study. Learn more about the challenges Pharm-Olam expertly tackled for the sponsor. Learn how Pharm-Olam took over and provided a smooth transition for existing sites and achieve enrollment objectives in this head and neck cancer study. Learn how Pharm-Olam provided aggressive enrollment services in this hemorrhoidectomy study and ultimately earned the entire Phase III study from the sponsor. Pharm-Olam’s experience level and proactive approach were critical in the speedy recruitment of patients for this Phase II Post Herpetic Neuralgia study. Pharm-Olam provided global project management in this competitive recruitment study, carrying out the sponsor’s needs smoothly and efficiently. Discover how Pharm-Olam handled two challenging studies in anemia with chronic kidney disease patients involving over 25 USA sites and 100 patients. We recommended recruitment sites in Georgia in order to meet deadlines for this study. The sponsor later selected Pharm-Olam to run a second study in the same region. Learn about Pharm-Olam’s role in this abdominal pain treatment study and how we met the enrollment goal 1 week early despite unexpected challenges. Find out how Pharm-Olam rescued a study taking place in France and Belgium by recommending Poland as an enrollment site, meeting requirements far in advance. Learn how Pharm-Olam beat enrollment goals and stayed ahead of schedule in this Phase III study for prevention of blood clots after hip replacement surgery. Pharm-Olam overcame a long list of challenges in this acromegaly study. Learn how we met enrollment goals and earned an extension study from the sponsor. Pharm-Olam completed enrollment using only 41 out of the 49 planned sites in this study. Find out what the sponsor had to say about the efficiency of our services. Pharm-Olam played an integral part in the enrollment of the additional patients in this Phase III study. Discover how we met and surpassed those goals. Learn how Pharm-Olam approached short recruitment timelines in this Phase II dermatology study and managed to meet deadlines 5 weeks ahead of schedule. Pharm-Olam was contracted to perform and manage all aspects of this Phase I/II Acromegaly study. The sponsor later awarded us their Phase III study. Learn how Pharm-Olam resolved challenges and met tough deadlines in this Phase III Crohn’s disease study, which ultimately led to a successful FDA application. VAP demands that meticulous care efforts be taken. Pharm-Olam proudly partnered with a progressive drug development company in their search for a solution.